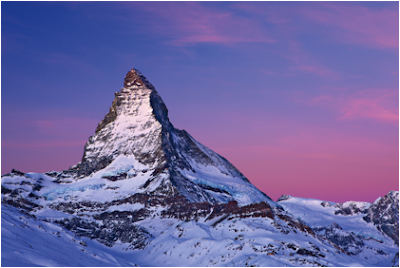 Switzerland Tourism has announced that travellers to Zermatt in July this year will be in for a treat as celebrations for the Matterhorn's 150 years since the first ascent on 14 July 1865 will be in full swing with a multitude of activities taking place throughout July and August. Director or Switzerland Tourism, Mark Wettstein, says Zermatt has lined up a series of highly enjoyable events to celebrate the occasion, including an the open-air theatre, possibly meeting Queen Elizabeth, village tours, hikes and the Zermatt Folklore Festival where they can get in and amongst the 1,200 participants from around the country dressed in folklore costumes. To kick off the celebration, Zermatt's first open-air theatre at 2,600m above sea level on the Gornergrat will see 40 performers artistically deliver the "The Matterhorn Story". Documenting the dramatic and triumphant, yet tragic first ascent of the pyramidal summit, the theatre performance guarantees to take audiences on a gripping emotional roller coaster. It premiers on 9 July and concludes on 29 August. During the jubilee week of 10-18 July, other events that will keep visitors occupied and entertained include the illuminating of the Matterhorn, a range of alpine excursions and the celebration of Italy Day where alpinists from Italy, France, the UK and Switzerland join famous alpinists such as Hervé Barmasse in Valtournenche in Italy to commemorate the Matterhorn. To top it off, the much-anticipated celebration may even be graced with the presence of her Royal Highness, Queen Elizabeth of England, along with other international guests of honor during the Gala event. According to Mark, more than 13,000 Australians visit Zermatt each year; and while most visits peak during winter for skiing and snowboarding, more and more Aussies are enjoying the region during the warmer months as well.